M4 RUBBER WASHER OD10.0 x ID4.2 x T1.5MM (20021231) ~ OM PLASTIC INDUSTRIES PVT. 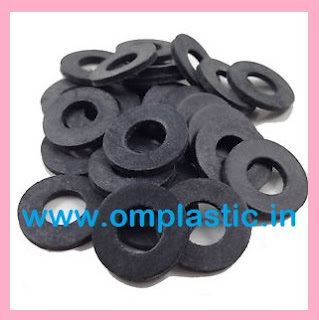 LTD.
Our clients can avail from us supreme quality Rubber Washers as per their demands at industry leading prices. These washers are well-known for their durability, light weight and resistance against adverse conditions. Our quality controllers test the raw material and the range of products on certain well-defined parameters. These are manufactured by our highly qualified professionals under complete observance of the international standards of quality. Owing to heat resistance, high durability, scratch resistance and dimensional accuracy, our offered washers find wide applications in petrochemical processing, automobile industry, metallurgy, etc. Also, we offer this range in customized options to meet numerous industrial applications of our clients.